« Still in a Christmas-y mood. October’s been a phenomenal month for girl time! I enjoyed the weekend in Portland, and then last weekend spending time here in San Antonio, and then yesterday, more fun times with some wonderful, wonderful women. It is an amazing thing, what my little hobby has brought to me. The friendships I have because of it, the good times I have to remember . . . All because of a little block of wood with some rubber stuck on it, and a community built on that block. Despite the late start (which involved me sitting in the turn lane waiting for my knight in shining armor (Joe Streiff!) to come help me, and then a tow to the nearest Nissan dealership), we had a blast up I-35 in Salado, Texas. 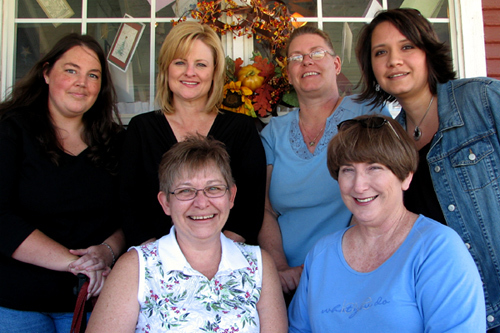 Anna, Sharon, Jeanne, Sherry, Bev and I decided to get together since Sherry was in town. We had so much fun! Anna is just a doll, Jeanne & Sherry were a hoot to carpool with, and it was soooo good to spend time with Bev & Sharon here in Texas! We shopped at Stamp Salado and brought home some pretty things, had a yummy lunch, and then did some shopping at a couple of the other stores in walking distance. I had SUCH a terrific time on Saturday with y’all! The only problem was that the day was too short. We must do it again. Who wants to come to Texas? Sherry will tell you that we’ll show you a good time! I needed a little break from working on invites for a fundraiser dinner my uncle’s campaign people are putting together (200. With star brads holding the layers together, and then cardstock to hide the brads. Ugh. ), and I’d just gotten some new stuff in the mail, so I played with what was closest! She is SO cute, isn’t she? I love these Elzybells stamps, and was so tickled to have the ones I’d ordered when I came home from shopping on Saturday. I was super happy about that speedy shipping! I also needed a quick baby card for one of Mike’s coworkers, and made this one. The A Muse 4 bar notecards made both of these cards a cinch to put together. Simple, easy, fast. Just my style right now! Hopefully I’ll have some time to play with all of the new stuff that’s showing up around here lately! The stuff is calling me, but first, back to the invites! Im packin’ my bags NOW!! I wanna come to Texas!!!!!! These are adorable, especially the Elzybell image. You’ve sold me, I’m off to shop! What a great day we had!!! Thank you so much for making this trip such a memorable one for me — Good Times!!! 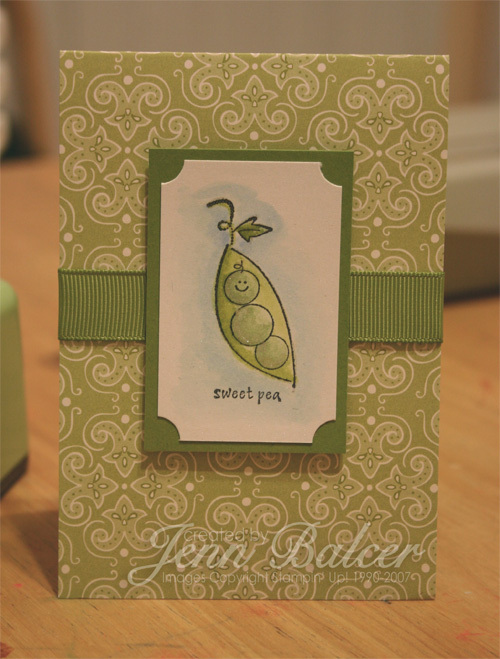 OMGosh, what adorable card, Jenn! 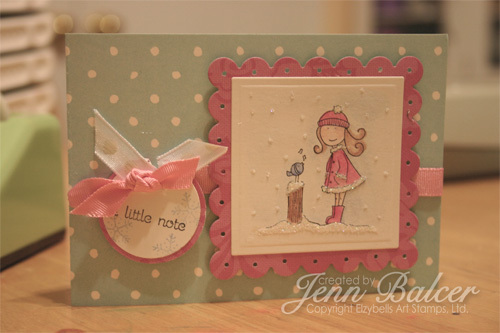 Love the blue & pink combo for the Winter one and the Sweet Pea one just pops with that green card base . . . darn-it, you’re going to make me go online shopping now! Fun, fun times in Salado — so glad we got together! What’s that? Come to SA? I’m already here! Just tell me when and where! LOL! Your first paragraph for this entry says it all so beautifully. Thank you for sharing. Love ya’ll and SCS. Dang – I *must* get to Texas so I can party with y’all down there!!!! It looks WARM!!! LOL!! I WANT TO COME TO TEXAS!!! Especially if I get to ride shotgun with you! Oh, and I want that pink card too… and, and, and…. lol. What a great picture. Looks like you all had a fantastic time! m u s t c o m e t o T e x a s . . . beautimous things and people await . . . *sigh* . . .
Oh…. your Elzybell girl and the glittery snow…SO cute. And I have long loved that sweet pea stamp. Your card is adorable! This Elzybell card is TDF! What amazing colors!!! Both cards are just so soft and lovely!!! I think Texan’s have more fun! Jenn, these are both beautiful, but that Elzybells one is SO sweet! Mine came yesterday and I didn’t get a chance to play. . . Love what you did with it! Those cards are just the cutest! Oh my goodness! You’re going to make me get that Elzybells stamp, aren’t you? Oh wow, so many of my favorite stampers all in one place, and just down the road from me!! I am so jealous!! 🙂 Looks like loads of fun! Wohoo! You girls are still partying! Looks like a blast! DArling cards! Love those new stamps and your colors and details!